SEEK is a quick and easy to program 64 step CV/gate sequencer loaded with useful features for creating carefully crafted or completely generative sequences. 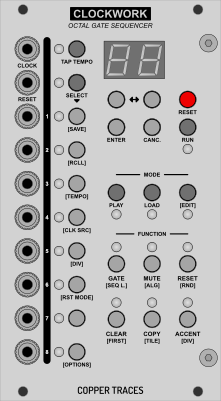 CLOCKWORK is an eight output gate sequencer with an independent programmable 64 step gate sequence per output. EARTH is a multifunction dual VCA that uses phototransisters for a sweet, slightly rounded over tone. DUAL AD is a snappy dual analog envelope with switchable sustain.